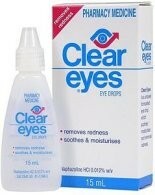 Product Use : Clear Eyes are used to treat eye redness and help relieve minor eye irritation. Clear Eyes are soothing moisturising eye drops used to treat eye redness and help relieve minor eye irritation due to swimming, plant allergies (pollen), colds, smog, sun glare, wind, dust and wearing contact lenses. Clear Eyes Drops also provide relief from discomfort associated with overuse of the eyes for activities including reading, driving and watching TV. Place 1 or 2 drops into each eye up to four times daily. First check with your Pharmacist that Clear Eyes is right for you. Do not touch bottle tip to any surface since this may contaminate solution. This product should not be used by individuals suffering from glaucoma or serious eye diseases. Remove contact lenses before use. Discard contents 4 weeks after opening. If symptoms persist or you have side effects, discontinue use and consult your health professional.